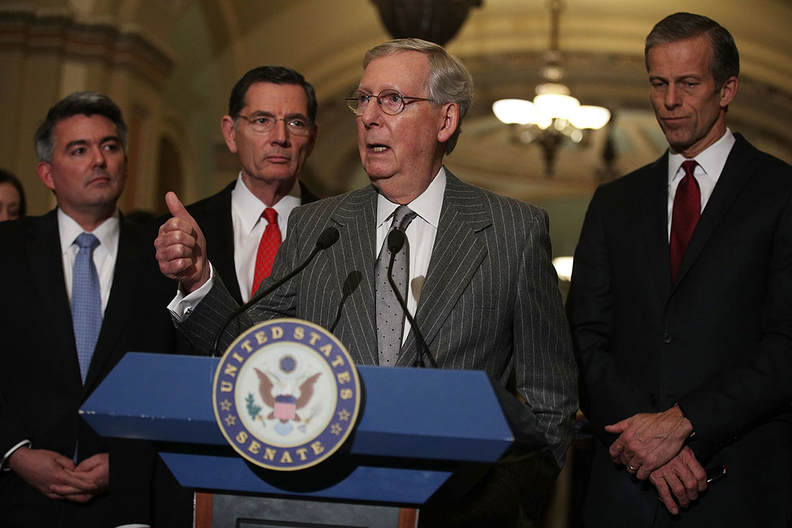 McConnell, flanked by Sen. Cory Gardner (R-Colo.), Sen. John Barrasso (R-Wyo.) and Sen. John Thune (R-S.D. ), briefs reporters this week on the GOP agenda. Efforts by Senate Republicans to reduce the number of Americans who would lose coverage under the GOP healthcare reform bill face some stark political arithmetic: Restoring coverage for many or most of the 24 million people projected to lose it would cost lots of money conservatives don't want to spend. On top of that, a higher price tag for the bill could jeopardize its ability to meet the Senate's strict budget reconciliation rules, through which Republicans hope to avoid a Democratic filibuster and pass the bill on a strictly party-line vote. Bills passed through reconciliation cannot raise the federal deficit more than 10 years out. “If the Senate wants to cover more people, it will cost more money than the House bill,” said Rodney Whitlock, a Republican healthcare lobbyist and former Senate GOP staffer. Sen. John Thune (R-S.D.) and other Senate Republicans told the White House Tuesday they wanted the House GOP's proposed American Health Care Act changed to boost premium tax credits for poorer, older Americans and people in rural areas. Those groups would face huge out-of-pocket cost hikes under the current legislation. They want the tax credits to be based on income and geographic location as well as age. Insurance premiums often are higher in rural areas. By 2026, individual-market premiums would be 20% to 25% higher for a 64-year-old than they would be under the current ACA-based system, according to Monday's Congressional Budget Office report on the House GOP bill. Meanwhile, GOP senators and governors are pressing for elimination or changes in the bill's phase-out of enhanced federal funding for the ACA's Medicaid expansion to low-income adults. They also seek revisions in the bill's caps on total federal Medicaid payments to the states, which the CBO said could lead to cuts in eligibility, covered services, and provider payment rates. Republican anxieties soared following release of the CBO report projecting the AHCA would lead to 24 million more uninsured Americans by 2026, with a disproportionately negative impact on lower-income and older people. On the other hand, it would cut the federal deficit by $337 billion over 10 years, largely by slashing Medicaid spending by $880 billion and shrinking the number of beneficiaries covered. There are ways Republicans could tweak the bill to increase its coverage levels, though they carry political, policy, and budget tradeoffs. For instance, they could boost the proposed premium tax credit for people with incomes under 300% of the federal poverty level while lowering the credit's phase-out from the bill's current threshold of $75,000 for individuals and $150,000 for families. Depending on how much more generous they decide to make the tax credits for low-income people, it may be possible to partially or entirely offset those increased costs by lowering the income limit,” said Ed Lorenzen, senior adviser at the Committee for a Responsible Federal Budget. Mitigating the coverage losses from the bill's repeal of Medicaid expansion funding and its cap on federal Medicaid payments to the states will be tougher. Many Republican governors and senators would like to extend the ACA's Medicaid expansion to low-income adults or make it permanent. Phasing out the Medicaid expansion funding would cause about nine million of the 24 million total coverage loss, according to an analysis by the Committee for a Responsible Federal Budget. Removing the bill's repeal of Medicaid expansion funding would reduce the bill's savings by $525 billion over 10 years, Lorenzen estimated. But that would cause the bill to increase the federal deficit by nearly $200 billion, which would violate budget reconciliation instructions approved by the House and Senate in January. Under those instructions, the bill has to produce at least $2 billion in deficit reduction in the first 10 years. Alternatively, the bill could preserve enhanced federal funding for the Medicaid expansion but offer states a matching rate lower than the 90% specified by the ACA but higher than the average 57% match in standard Medicaid. The problem with that is many states that have expanded Medicaid likely would drop it if they had to pay a significantly larger part of the cost. Another possible approach for Republicans is either to keep some of the ACA's taxes or phase them out more slowly. There are major political obstacles within the GOP associated with any of these possible changes to the bill, which run counter to the desires of the party's most conservative members. House conservatives are pushing to repeal Medicaid expansion funding this year rather than waiting until 2019. Right-wing congressmen and senators also want to pare back the premium tax credits, which they see as a dangerous new entitlement program. And keeping the ACA's taxes, particularly the investment and Medicare payroll taxes on wealthier people, would be anathema across the entire GOP spectrum. But even if conservative and more moderate Republicans somehow reached an agreement to boost the bill's coverage levels along with its price tag, the revised bill could face problems meeting the Senate's budget reconciliation procedures, named the Byrd rules after the late Democratic Sen. Robert Byrd of West Virginia. If the bill produced an increase in the deficit after 10 years, Democrats could try to scuttle it by asking the Senate parliamentarian, Elizabeth McDonough, to say it violated the Byrd rule. If she ruled in their favor, the Senate's presiding officer, a Republican, would have to decide whether to accept her advice or overrule her. There is growing pressure on House Republican leaders to pass a revised version of the bill that includes repeal of many of the ACA's insurance market regulations, such as the minimum essential benefits requirement. By allowing leaner benefits and bringing down the cost of health plans, those amendments could prompt the CBO to score the bill more favorably on its coverage impact. And they would have broad support among both House and Senate Republicans. But that approach, which Texas Sen. Ted Cruz has championed, most likely would run afoul of another part of the Byrd rule, which requires that provisions in reconciliation legislation must be germane to the budget. Go for broke, some say. While Senate GOP leaders technically could waive the Byrd rules on the healthcare bill, some experts doubt Senate Majority Leader Mitch McConnell and his veteran colleagues will go for that. “I don't know that there are 50 senators willing to violate precedent and go nuclear,” said Sarah Binder, an expert on congressional procedure at George Washington University. The Republicans would fear it would free a future Democratic-controlled Senate to blow through the Byrd rules to expand government, she added.